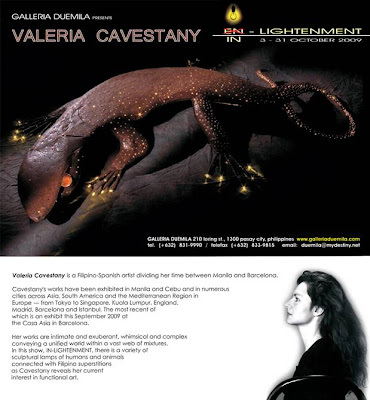 Valeria Cavestany is out to explore fresh views on old themes, this time pertaining to the relationship between humans and animals in her latest exhibit, IN-LIGHTENMENT, at the Galleria Duemila, from October 3-31. Featuring a menagerie of more than thirty animals welded in iron and lit from within the exhibit is a reiteration of the enduring universality of myths—or superstitions, as Cavestany sometimes likes to call it—or stories spun around common creatures like fish and insects, dogs and roosters, and members of the lizard family. World mythologies assign different meanings to different animals. For instance, snakes or serpents can be helpful or harmful, depending on whose story is being told. The Hopi Indians living in the dry American Southwest have stories about a water snake that is associated with springs while the Romans regarded snake spirits as protection for their homes. Precisely because the snake sheds its skin as it grows, some cultures view it as a symbol of rebirth and have associated it with healing. The Bible, however, describes the snake as a treacherous creature, and a Japanese myth tells of a huge eight-headed snake that holds a princess prisoner. The freighted relationship between humans and animals stems from their closeness throughout history, which in turn has given rise to myths and legends. Often, animals perform heroic deeds or act as mediators between heaven and earth. As in many cultures across Asia, they may also be the source of the wisdom if not hold the power of a shaman. For Cavestany, such resilience is also the enduring quality of people who triumph over setbacks. In a sense, reinvention is her personal story as well. The Spanish mestiza has taken the well-trod road of art—a choice that, at first blush, might seem to have been inspired by her mother, an exceptionally creative homemaker and model born and raised in the Philippines. But it was the desire to grasp the workings of the world and its ethnicities that impelled Valeria’s deliberate course, which first brought her to Manila in 1980. Fresh from a successful solo exhibit at the Casa Asia in Barcelona this August, Cavestany, through IN-LIGHTENMENT, seeks to speak anew on old themes in much the playful way she did at her exhibit Fragments and Flowers in Istanbul in 2008. Here, her thirty watercolor and mixed-media paintings bore her trademark boldness in combining, this time, Chinese, Filipino, Turkish, and Ottoman motifs. IN-LIGHTENMENT delivers on the same premise -- reviving the familiar through new materials to produce a fresh take on one of the oldest relationships that have bound all living things. Exhibit runs from October 3-31 at Galleria Duemila, 210 Loring Street, Pasay City. The gallery is open Mondays to Saturdays from 10 am to 6 pm. For more information, please contact Eryl Torres or Thess Ponce through Tel. No. (632) 831-9990 or Telefax (632) 833-9815, email: duemila@mydestiny.net or visit our website at www.galleriaduemila.com.